Getting sick or injured does not have boundaries on any specific person. At some point everyone will end up going to the hospital for an ailment or due to getting hurt. The severity of the issue is the one thing that can keep someone from having serious medical expenses add up. The other potential costly reason is if a person can wait to see a doctor at a regular exam or if they need to be rushed to the Emergency Room. It is estimated that one in every five adults in the United States will struggle to pay their medical bills. Even though the number of uninsured Americans has fallen by about 15 million people since 2013, medical expenses have gone up significantly. Medical bills are one of the leading causes for people to get trapped by the burden of debt. This issue has been thrusted into the news lately when the host of HBO’s show Last Week Tonight, John Oliver, cleared over $15 million of old medical debt. It is estimated that each year since 2013 that 56 million Americans under the age of 65 have had struggles paying off medical bills. Of those 56 million about 35 million will or have been contacted by a collections agency or agencies due to unpaid medical bills. In certain cases, the ones that have surging medical bills will look for areas to pay off their bills. Due to finding any way possible to pay off the medical bills and having collection agencies from calling some Americans will take on credit card debt. It is estimated by nerdwallet.com that 11 million people a year take on significant credit card debt because of their hospital bills. Once the credit card bills start in the average interest rate for a credit card is 15.07% according to creditcards.com. So, not only has the person that has decided to pay off their hospital bill with a credit card, they have also taken on more debt in the long run due to the amount of interest they would be paying over time. When someone is sick or hurt the last thing they should have to think about is, how am I going to pay for this? You need help and you need to get better. 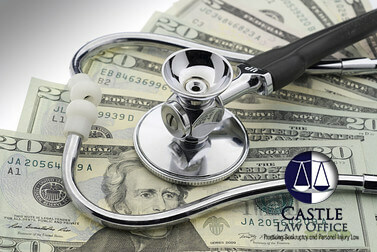 If you have found yourself trapped due to medical or credit card debt contact Castle Law. We work with people all across the Kansas City metro that need a fresh financial start and filing bankruptcy can be just what is needed to relieve that burden. Call us at 816-842-6200 or click on the link to contact us. You’ll be glad you did!